‘Anti-Conversion’ law quietly enacted while proposal for religious freedoms stymied. THIMPHU, Bhutan (Morning Star News) – While Bhutan’s government has quietly enacted an “anti-conversion” law that Christians fear will be used against them, a proposal to grant Christians the right to construct church buildings and form organizations remains stalled. 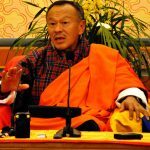 The government of Prime Minister Jigmi Thinley – the first democracy after the Buddhist nation’s bloodless transition from 100 years of monarchy in 2008 – brought in the law against conversion involving coercion or allurement last year. Few Christian leaders here knew that the country’s penal code now includes the stipulation, Morning Star News found. Christians in South Asia believe laws regulating conversions are aimed at thwarting Christian preaching and are based on the assumption that Christians use money and force to convert others. Christians in Bhutan, who number close to 15,000 in the nation of 708,484 people, agree that pressure and allurement are uncalled for in conversion. They deny using force or allurement to convert others and fear that the law could be misused to target them. “Christians share the gospel only with their friends and pray for the sick who are brought to them – that’s how Christianity has grown in Bhutan,” said a pastor of a congregation of about 170 people in Thimphu. Christians fear that the terms “coercion” and “inducement” have not been defined in the penal code, and that therefore even an act of legitimate charity can be misinterpreted as seeking to convert someone. In neighboring India, where some states have laws regulating conversion, Christians are routinely arrested on spurious complaints filed by Hindu nationalists. Such abuses could be worse in Bhutan, said the Thimphu pastor, as Christians here lack the backing of any organizations. “On the other hand, Buddhists and Hindus have organizations and function with legal identity, while Christians are not allowed to form associations,” he said on condition of anonymity. Another Christian leader said local officials try to give the impression that Christian practice is illegal. Section 463 (A) of the Penal Code (Amendment) Act of Bhutan 2011 states, “A defendant shall be guilty of the offense of compelling others to belong to another faith if the defendant used coercion or other forms of inducement to cause the conversion of a person from one religion or faith to another,” according to Bhutan’s official website. Section 463 (B) adds, “The offense of compelling others to belong to another faith shall be a misdemeanors,” which in Bhutan is punishable by one to less than three years in prison. The law, enacted on May 24, 2011, came into force on July 5 of the same year. Bhutan has numerous monasteries and a few Hindu temples, but no church building. Christians are generally allowed to meet in homes or private halls to worship on Sundays. And the Christians who insist on burying their dead, as opposed to cremation, have little option but to go to cemeteries in India. In 2010, the Chhoedey Lhentshog, the body regulating religious organizations under the 2007 Act, decided to consider the possibility of registering a Christian confederation as a legal entity, according to Business Bhutan newspaper. The proposal, however, remains unapproved. The government apparently does not want Christians to have a distinct, visible presence. Bhutan focuses on preserving its unique culture, which is seen as a national priority owing to the tiny nation’s geographical position between two Asian giants, India and China. Bhutan asserts and protects its sovereignty by showcasing its unique culture. Even if a Christian organization is registered with the Chhoedey Lhentshog, independent church construction with crosses atop will not be allowed in the country, Dorjee Tshering, the regulating body’s secretary, told Business Bhutan in January 2011. “Churches with spires, and mosques with domes, should not be allowed, as it will blemish the architectural, cultural and heritage landscape of the country,” he said. Most Christians, however, maintain that their legal recognition will not undermine the nation’s culture. Issues like cemeteries and crosses atop church buildings are negotiable, but what is most important is the right to function legally and with dignity as Christians, said the Christian leader. Prime Minister Thinley’s Peace and Prosperity Party is likely to get reelected in the next election, around April 2013. Christians haven’t lost hope of equal rights during its second term.